This is a miracle that the event could take place! 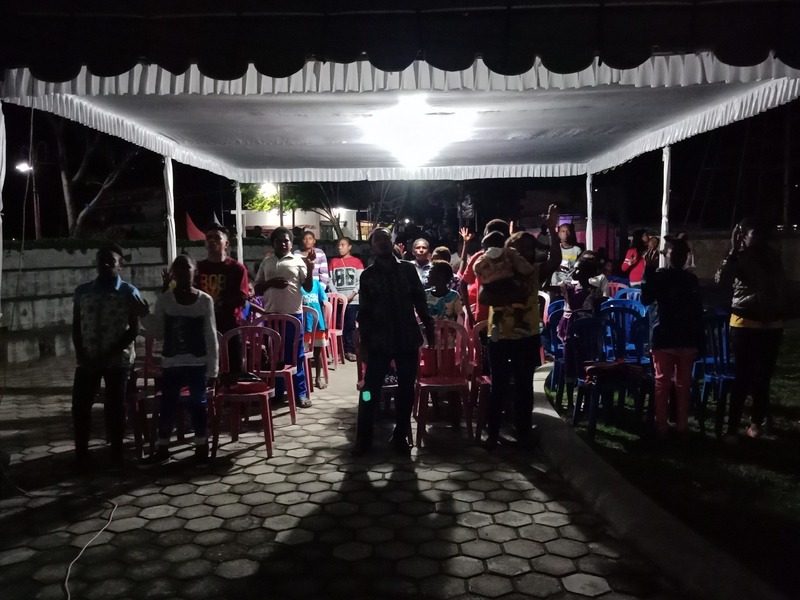 At 5.00 PM (Eastern Indonesian Time), 3 tents were ready with 100 seats and screen was prepared by the committee and sound system was ready too, which assisted by the community of young people “New Life” of GPDP (Pentecostal Church in Papua). We played spiritual songs, so congregations came to the city park. Exactly at 6.00 PM, the congregations had come to the city park, we played spiritual songs with keyboard. 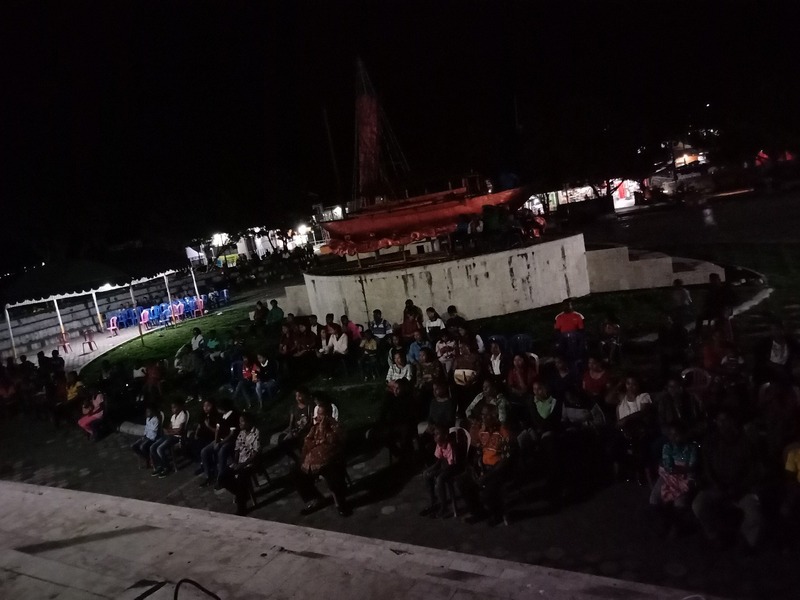 Then we aired Facing the Giant movie for 20 minutes, praise the Lord the congregations started arriving, the seats were filled and the seats beside the city park were full of many people as well. We started the crusade at 7.00 PM. There was a truck carrying the congregations from House of Representatives complex, about 30 congregations. Rev. Nico Damar and two singers with a keyboard only, began singing the opening song “Hari Ini Hari Yang Telah Dijadikan Tuhan”, requested all present congregations to rejoice. There was a woman wearing a house dress, she had sore foot, came from the shop sitting in a large pot, there were also 3 people sitting there too. Several God’s servants had also been present, Rev. Nico Damar invited Rev. Dinar Nosseny from GPI Batu Penjuru to open KPPI service. 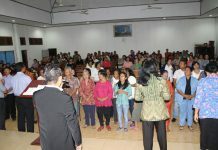 The congregations and God’s servants from various churches were still coming, the worship leader continued with the praise “Hari Ini Ku Rasa Bahagia”, and remained with the praise songs. Afterwards, films of miracle healing were aired, one from Mrs. Vera Yuliana Tamaka who was cured from chronic knee pain. Another film testimony was from Ms. Matilda who had left-sided breast cancer. Rev. 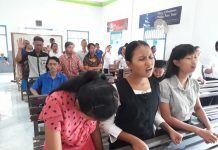 Nico Damar requested the congregations to prepare their hearts to hear Word of God and later Ms. Selvi Wiguna summoned the whole congregations to look with faith to God, that He was present and for God there is no impossible thing. When asked who came in sicknesses and had many problems, then she said to them to put the trust in God, as for God nothing is impossible. Ms. Selvi Wiguna delivered the Word from Matthew 9: 18-26, concerning the woman who had hemorrhage. Where there were 2 miracles that the Lord Jesus did, Jesus healed 12-year hemorrhic woman and raised a dead daughter of synagogue head. That synagogue head knew how to ask for a miracle from God by worshiping the Lord Jesus and asking Him to come to his house and lay His hand upon his dead daughter. And the Lord Jesus always wants to help. He got up and went to the synagogue head’s house together with His disciples. On the way to his house, Jesus met a woman, who was bleeding. She approached Jesus and touched the tassel of His robe. With her sick condition, by all means this woman could approach Jesus and touch from the bottom of Jesus’ cloak. This woman’s faith moved her to be able to touch His robe. And the Lord Jesus knew about it and then healed her hemorrhage. Upon arriving at the house of the synagogue head, Jesus only said that this girl did not die but fell asleep even though the people around him were flute-blowers and the crowd did not believe it, even laughed at Him and they were finally expelled. Jesus came in and took her by the hand, subsequently the dead girl rose. Although it seems impossible for us to be healed, or our problems can be solved and even we do not trust in God anymore. We have a great God, He is able to cure pains and raise the dead. If we look up, stare at the stars and the moon, who created them? God. We have a great God, He who is able to create non-existent becomes existent, who can do what we can not do, but for God nothing is impossible. Inviting all the present congregations at the city park to listen to the voice, to believe in the Lord Jesus. 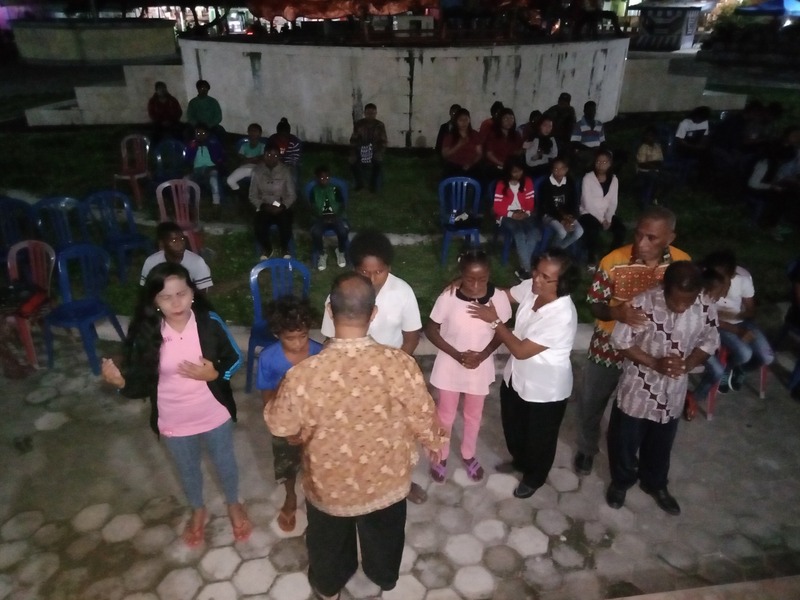 Some were sitting outside at the city park and some were selling at the side of the city park, sang a song “Mari Masuk” and prayed to receive the Lord Jesus. Thank God there were 400 souls saved. It was stated that the Lord Jesus died for us on the cross to bear our sins and sicknesses in His Body and by His wounds we are healed. Trust in the Lord Jesus, hold the painful part and be faithful. There were 9 souls who came forward, 4 sick, and those who had problems 5 souls. Mr. Dharta Adinatas and Ms. Selvi Wiguna prayed for the sick from the pulpit, then the Lord’s servants helped pray for the sick. Singers were singing “Bagi Tuhan Tak Ada Yang Mustahil”. Those who went forward to be prayed, experienced some illnesses such as pain in the legs, hand cramp, and tuberculosis. 1. Mrs. Lince who came with pain in the legs because of accident, healed and could be strong walking. 2. Mrs. Alfince, the whole body was cramp, her hands were hard to be moved, but that evening they could be moved and no longer cramp. 3. Berto was painful in the chest, but after being prayed, he was not sick anymore. After healing testimony, continued praying again for those who were sick, but they did not want to come forward so that they would receive God’s miracles. Rev. Nico Damar as the worship leader, kept up raising the praise song “El-Shaddai”, inviting all the congregations to praise God for what God had already done that evening. Furthermore Ms. Selvi Wiguna went forward to pray for those who would serve the Lord. Thank God there were 40 souls whose hands were raised up and prayed to be able to serve God wherever they are and they were asked to return to their own churches. Before closing the service Rev. Nico Damar, took the congregations to sing “Hormat Bagi Allah Bapa” and asked Rev. Alfred Adilis from GKPB (New Testament Christian Church) to close KPPI crusade. There were about 15 God’s servants and 6 young people who were actively involved in the preparation of KPPI. They were delighted and joyful, it clearly seen the zeal to bring souls come to KPPI and serve together. Praise the Lord! Hallelujah thankful for God’s work in Kaimana!